Setup Menu 4 on your EOS 80D contains the following offerings. But note that you get access to all the menu items only when the Mode dial is set to one of the advanced exposure modes (P, Tv, Av, M, B, C1, or C2). You can set the camera back to its default settings by choosing Clear All Camera Settings on Setup Menu 4. Multi-function lock: Control the behavior of the multi-function lock from this menu option. Custom Shooting Mode (C1, C2): You can create your very own exposure modes through this option. Clear All Camera Settings: Choose this option to restore the default shooting settings. You can’t perform this task while the Mode dial is set to C1 or C2. Also be aware that not all camera settings are reset when you choose this menu option; the camera manual has a list of items that remain unchanged. Look in the “Before You Start” section of the manual provided in your camera box. If you just want to restore the original Custom Functions settings, instead open the Custom Functions menu and choose Clear All Custom Functions. Copyright Information: If you want to include copyright information in the image metadata (invisible text data that gets stored with the image file), this option gets the job done. Certification Logo Display: You have our permission to ignore this screen, which simply displays logos that indicate a couple electronics-industry certifications claimed by the camera. You can find additional logos on the bottom of the camera. Firmware Version: This screen tells you the version number of the camera firmware (internal operating software). 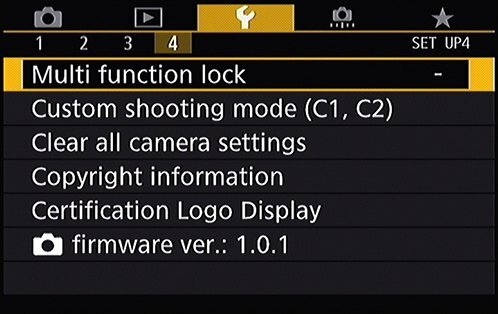 When you select the menu option, you see a firmware item both for the camera and for your lens (assuming that you use a compatible Canon lens). At the time of publication, the current firmware version was 1.0.1 for the camera and 1.5.0 for the 18–55mm kit lens. Keeping your firmware up to date is important, so visit the Canon website regularly to find out whether your camera sports the latest version. Follow the instructions given on the website to download and install updated firmware if needed.